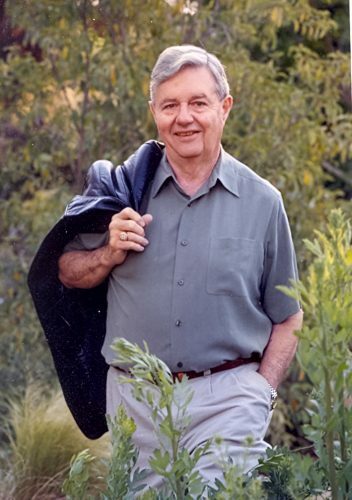 Rudy Schafer, a creator of PLT who continued to contribute to the vibrancy of our program and of many other environmentally focused organizations, died in September 2007 at the age of 80. A southern California native, Rudy because a journalist and then a teacher after service in the Navy during World War II. He and his family spent 11 summers at the Olympic National Park, where he worked as a seasonal park ranger. Perhaps it was this combination of words, the classroom, and nature that inspired Rudy to become a leader in what was then a brand-new field: environmental education. Rudy was committed to teaching young people “how to think, not what to think” about complex environmental issues. In the early 1970s, Rudy brought together educators, conservationists, industry, and government agencies responsible for natural resources in 13 states, to found the Western Regional Environmental Education Council. The Council started Project Learning Tree, an innovative program that teaches young people about the environment by getting them to think about their role and relationship with the environment. WREEC (now the nationwide Council on Environmental Education) and the American Forest Institute (now the American Forest Foundation) joined forces soon after. (Editor’s Update: In 2017, the Sustainable Forestry Initiative became the new home of PLT.) PLT was so effective it inspired the formation of other environmental education programs based on the PLT model, including Project WILD in 1983 and Project WET in 1992. Rudy’s vision, energy, and insistence on objectivity and excellence were key factors in ensuring that PLT was created in a way that, as he put it, worked at the “9 o-clock Monday morning” level—in other words, that teachers could easily use the curriculum on a regular basis with their students. The literally thousands of PLT workshops and hundreds of thousands of well-thumbed PLT guides in circulation over the past 30 years are testament to the success of his goal. Rudy had requested that any remembrances could be contributions to PLT. Along with his loving family, we’ve established the Rudy Schafer Memorial Fund to honor and celebrate his life’s work. If you would like to make a memorial contribution to PLT, please visit our donation site. Rudy said that “all of us involved in PLT share a great tradition. We do important things for students, the land, and for the future, and we’re justly proud of our accomplishments.” Rudy’s impact lives on in all of us involved in Project Learning Tree.